As a long time Salesforce-to-Salesforce (S2S) advocate and interested follower of the Saleforce integration space the Winter ’14 pilot of cross org data sharing, or COD for short, caught my attention recently. This short post covers the essentials only, for the detail refer to the linked PDF at the end of the post. Note, the pilot is currently available for developer edition (DE) orgs exclusively, which gives some indication of where this feature is in term of production state. Hub and spoke architecture; the hub provides the metadata definition (selected fields) and data for shared objects, the spoke gets a read-only copy (proxy version) of the object named with the __xo suffix, e.g. myObj__xo. Connections are established via an invitation email, generated at the Hub, sent to a Spoke administrator and accepted. Synchronisation takes place via the [Sync with Hub] action on the Spoke Detail page, which also displays the status of the org connection. Synchronisation is a manual process, in the pilot release at least. All custom objects can be shared but only the Account standard object. API limits apply in addition to specify platform limits applicable to COD (for example, Spokes per Hub, concurrent Spoke connections). Master data sharing in Multi-org architectures. Reference data sharing (product catalog, price list etc.) with business partners. S2S initial record sharing can be automated (via ApexTrigger). S2S externally shared records synchronise automatically. COD is definitely an interesting new addition to the native platform integration capabilities. Data sharing between Salesforce customers via ETL tools or file exchange can be error prone and time expensive to maintain. COD provides utility in terms of simplification, centralised administration and tracking. In considering the pilot release, S2S remains the best fit for transactional data, whilst COD provides coverage of reference data and some master data scenarios. The figure above shows a complex multiple org architecture (Hub-and-Spoke model). I’ll return to the drivers for multiple-org versus single org in a future post. For now let’s consider some interesting aspects of the above scenario. SSO : users log in via their Active Directory Credentials. The CORPORATE org being a SAML 2.0 Service Provider to the AD Identity Provider. The CORPORATE org is also aN Identity Provider, enabling SSO across all child-orgs (which are SP). Managed Packages : versioned baseline functionality. It’s often the case that certain configuration elements are common across orgs in a multi-org architecture. A best practice is to distribute this metadata as a managed package thereby preventing local modification. The business owners of the client org are free to innovate in their org, but the baseline configuration is locked (possibly to ensure compatibility with data sharing processes). Managed packages arenot just for ISV. Salesforce-to-Salesforce : data sharing (automated or manual). 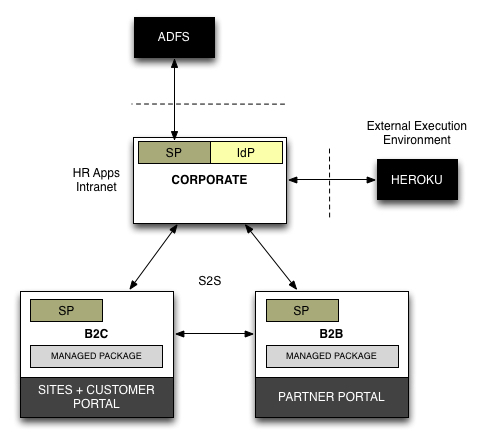 S2S is a very underrated technology, enabling bi-directional, selective sharing of data between orgs. A great fit for multi-org architectures where common data can be shared across all orgs, or partitioned (geographically, business type etc.) and perhaps consolidated at the CORPORATE level. External Execution Environment : complex, off-platform processing (perhaps legacy components written in Java). Salesforce orgs are subject to execution limits (governor limits etc. ), whilst this becomes less restrictive with each release, there are times when an external execution environment can be helpful. For example a payroll calculation engine (written in Java and used within the enterprise) could be deployed to Heroku and called via Apex. Personally, I look to repurpose or buy technology before coding anything – the ability to assemble a solution should not be overlooked.